Arrays of richly hued fruit or beaded necklaces in Carmela Kolman's paintings suggestively evoke abundance, fertility, and glamour. The Painting Center is pleased to present Kolman's evocative imagery in her first two-person show at the gallery (with artist Scott Noel, see separate exhibition information). 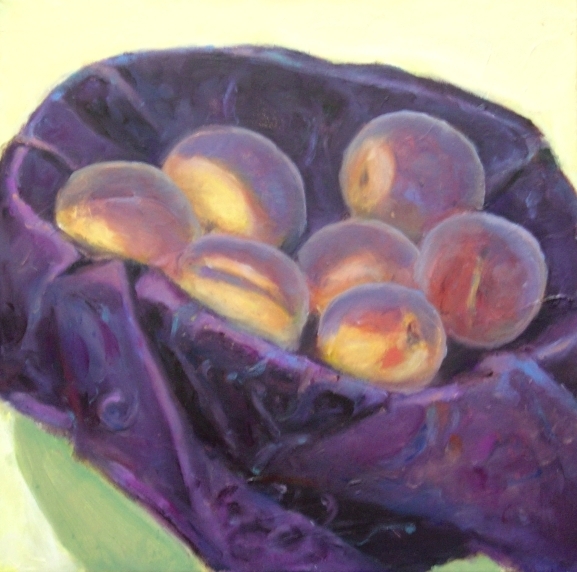 The two bodies of her recent and new work are united around the theme of "Fruit and Baubles." Kolman is a well-respected New York painter (RISD BFA; Yale MFA) who has previously shown work at The Painting Center. She regularly exhibits with the association of still life painters, Zeuxis. Yet her compositions' compressed recession and expansive spaces abstract the tabletop format of that traditional genre. In Kolman's imagery individual obejects are modeled into illusionistic volume which, in turn, are often exhoed in shadows so prominently shaped and strongly colored that their presence becomes a crucial element to the composition. 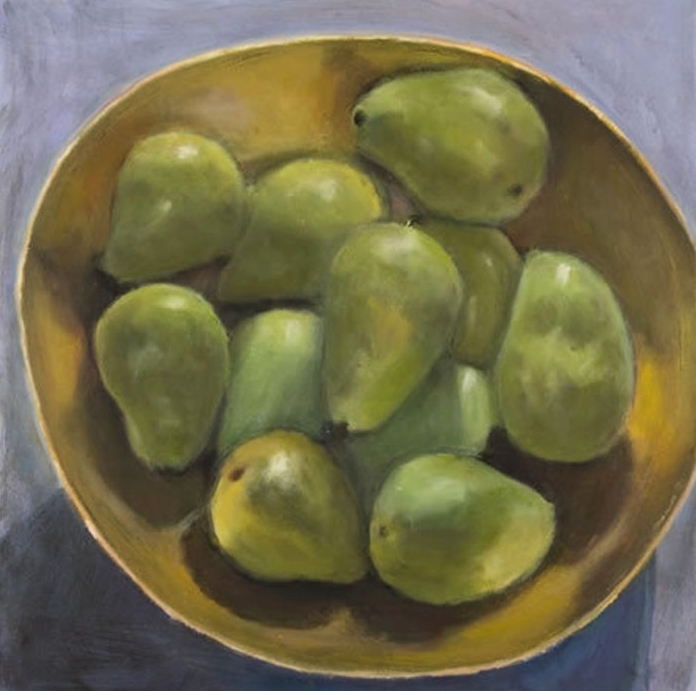 She further subverts the traditional frontal perspective onto table top arrangements - the cornerstone of traditional still life - by viewing her objects from immediately above. They are seen against ambiguous grounds that aren't necessarily either table or wall - in effect, presenting a modernist flattening of space. This close aerial viewpoint generates a more intimite relationship with the work. Having focused for the past decade on fruits, Kolman recently turned her attention to beaded necklaces. This exhibition shows that transition by including works from both motifs. Continuing the visual duality of vivid spheres loosely arranged and projecting from flattened grounds, the new work makes more explicit the female coding of her lucious globules. In the history of art, depictions of jewelry have connoted material wealth, female galmour, vanity, and - strewn across bedsheets - sexual abandon. Kolman's random serpentine strings of radiant beads, loosely brushed, call up multiple associations of property and allure.